Project Learning Tree’s GreenSchools for Early Childhood program specifically meets the needs of early childhood educators and younger learners. It is designed to teach young children about their environment and how they can make a difference, while developing their skills in language, mathematics, and science. 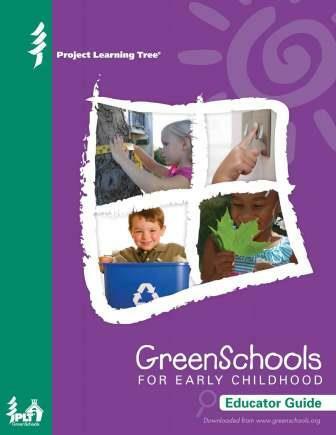 PLT’s GreenSchools for Early Childhood program includes an Educator Guide and 5 investigations. The Educator Guide offers ideas and activities for early childhood educators to green their centers while facilitating environmental experiences with their students through art, movement, sensory exploration, and time outdoors – all of which are inherently appealing to young children. You’ll learn about the benefits of becoming a PLT GreenSchool, how to engage parents at your center, ways to assess your students’ learning, and how to celebrate your success. Five Investigations will involve your students in helping to green your center while developing their skills in language, mathematics, science, and more. 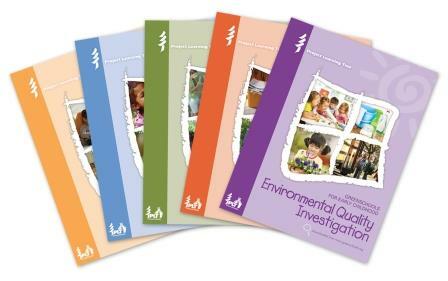 Explore what individual and collective actions you and your students can take to improve the health, safety, and environmental quality of your school or early childhood center around 5 topic areas. You’ll discover how reducing your school’s environmental footprint is not only good for your health, your children’s health, and the health of the environment, but also can save your school money. Energy: Investigate how much energy your center uses, the main sources of that energy, and ways to implement energy-saving strategies. Environmental Quality: Investigate areas where improvements can be made in indoor and outdoor air quality, for example, in your center’s carbon dioxide and temperature levels, how cleaning products can impact your air quality, and what practices need to be followed regarding the use of hazardous materials. School Site: Investigate natural habitats, wildlife, trees, grounds maintenance practices, and ways to make improvements to your center’s site. Waste and Recycling: Investigate how much waste your center generates and where it goes, as well as recycling and composting efforts. Water: Investigate the source, cost, and quality of your school’s water supply, and ways to enhance current water conservation practices. A Green Your Home handout to extend the learning and help families learn how they can improve their home environment. To access the materials, visit www.plt.org/greenschools/early-childhood/ and register or log in. If you are looking for more Early Childhood activities, be sure to check out PLT’s Environmental Experiences for Early Childhood. This guide is now also available electronically as part of PLT’s new online course for Early Childhood.